Definition: A type of girdle or belt, usually of leather, which was worn by women in Ancient Rome. It was worn over the inner tunic and wrapped snugly over or under the breasts. This is a Latin term; see below for Greek equivalents. Plural: Strophia. Period: Ancient Greece and Rome. - Fascia/Fasciola: These terms may be used to refer to a strophium, but they refer more generally to a piece of cloth wrapped around something, like a royal's head or (by women) the legs and feet. - Mitra: Used to refer to strophia in the later Empire. See - Mitra. 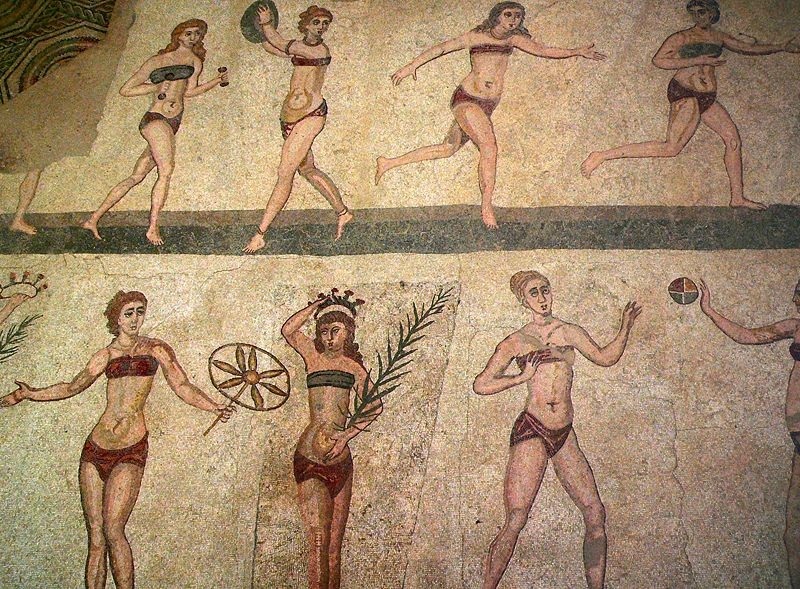 The "Bikini Girls" mosaic in the Villa Romana del Cesale near Piazza Armerina, Sicily, dating to the 4th century AD. Each young woman in the section seen here on the left wears subligaculum in addition to her strophium.